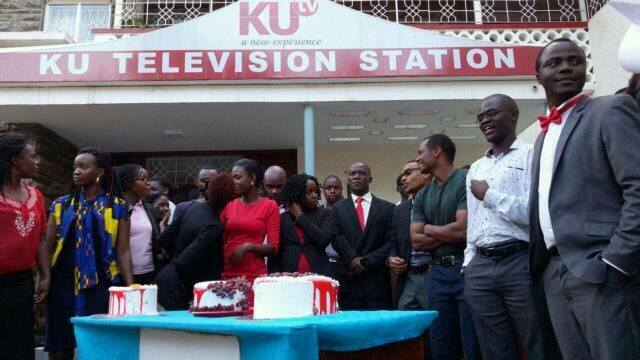 KUTV celebrate its first Birthday – Kenyatta University TV (KUTV). All Rights Reserved. Kenyatta University Television (KUTV), through the stewardship of Dr. Sperenza Ndege – the director,yesterday celebrated the first year, anniversary, since the studio was launched on November 7th, 2015. Speaking during the event, Ndege applauded the team for the commitment in making the station top the list of fastest growing media houses in a unique. “I am happy with the team for its devotion to making the dream a reality. I appreciate the likes of production, editorial, news team, camera people, supporting staff and the marketing team for the good work they have been doing,” she said. Ndege could not forget to salute the former vice chancellor, professor Olive Mugenda, partners during the launch (Deusche-Welle) and the acting Vice-Chancellor, Professor Paul K. Wainana, and also the support she received from the university committee headed by professor Michieka Ratemo. “To our advertisers, we say thank you. As we enter our second year on-air we promise you our fans mix of entertainment you have never come across,” she added.